St. Paul was a New Yorker. People from New York are recognizeable by their svelte builds, the glow of 14 karat cultural immersion, and the easy eyes that own everything and are never impressed. Two thousand years ago, you see, Rome was New York. Now it is a tourist trap. That might give New York a little humility, although with humility, New York would not be itself. I don’t know how to describe Kansas City. I’ve lived here most of my life, so I can’t really see it clearly. I try a few comparisons: it’s Detroit without Motown. It’s Chicago with way less money, many fewer people, and better weather. It’s Minneapolis without famous writers. It’s Omaha, with more grit and slobber. It’s home, which is always and never enough. I have described Kansas City as a “backwater,” which isn’t necessarily an insult. You won’t be swept away here. Your talent might go unexpressed, unfired, or unappreciated, but you won’t be worn down by the current. You won’t be tossed aside. There isn’t that much force in the life here. You can soak peacefully. The things I do love in Kansas City are the western city things: the space and the broken and abandoned spaces in the city, the way people put things together and share. What I love is that there is a rebellion to creating culture in a place where people don’t look for culture. We make things for ourselves and for their own sake. If your ambition was to set the world on fire, you wouldn’t be here. But who needs the world? What does that mean, anyway? How dare other people define “the world” for us? Other people are out front of us. The coasts are trying things out, so that we don’t have to. They make the bigger mistakes. They make themselves fools. We wait things out. They think bigger and wilder. We think deeper and sleep more. Some days I think that the fateful events that kept me a Kansas Citian all these years strangled my ambition and muffled my voice. That I am one of the lost, small people that no one cares about, where nothing starts and nothing flames up. 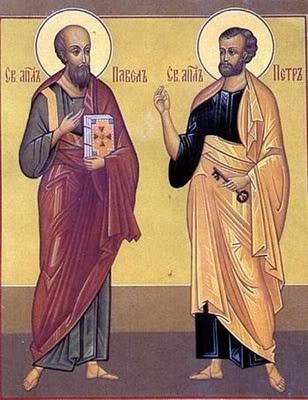 Today is the feast of St. Peter and St. Paul. The day they share, although they both have their own individual holidays as well. Today is the day they stand together, two people who had little in common, and almost definitely did not get along. It’s encouragement to everyone now who goes to church with people they have nothing in common with, and don’t like. St. Peter was from a backwater, and probably remained a person who would be dismissed by New Yorkers. He did not know how to navigate Rome. I love St. Paul because he is the Chrysler Building. While I’ve always loved Paul more, mouthy, scholarly Paul, I am probably more like Peter: his serviceable boat, his insistence on circumcision, and my about-town Honda, my dismissal of skinny jeans. That doesn’t mean some of us won’t make a splash. Some of Peter’s friends became quite famous, considering how boring and lame as Galilee was. You just never know. As I think about leaving KC in less than a week, I like this very much. I have often wondered if I will be better able to reflect on Kansas once I’ve left.